Following the civil war in Syria, since early 2011, which turned to be also a religious war between Sunnis, the majority of the Syrian rebels, and Bashar Assad’s Alawites, a religious denomination considered to be by many Sunnis as “heresy” and attached to the Shia faith, thousands of Sunni Muslims flocked to Syria to fight for “Islam” (see – SYRIAN DILEMA). 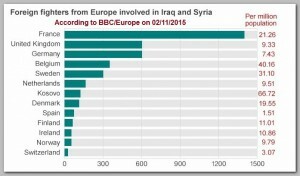 Initially most of the foreign volunteers came from Muslim countries, especially from Arab countries, but since 2012 a growing number of Europeans and from the Western Democracies came to Syria and generally joined the more extreme groups such as the Al Qaeda affiliated ‘Jabhat al-Nusra’ or what became known as I.S.I.S. The general profile of those “European Jihadists” is of youngsters, boys and girls, some of them as young as 14, born in a Western open and pluralistic society, second generation to Muslim immigrants and/or Muslim converts coming from all economical level. Almost all of them traveled to Turkey at first and were aided in local Mosques in Ankara or Istanbul to cross the border to Syria. According to Western security services in summer 2014 over 4,000 Western passport holders joined the war in Syria and later in Iraq and they present a future terror threat if and when they will return to their homelands, radicalised, indoctrinated and trained to commit sophisticated terror attacks. The Western Jihadists use skilfully the internet, youtube, facebook and twitter websites to recruit even more youngsters in the Western Democracies to the cause of fighting for Islam and Jihad. Although most of the Western Jihadists traveled to Syria via Turkey, some of them joined Islamic groups in Mali, Libya and Somalia. It is estimated that by june 2014 over 600 of the Western Jihadists were killed in Syria and Iraq since early 2011. Few hundreds returned to their homelands without any special difficulty. *FRANCE – According to a France’s top security official, in early 08/2014, nearly 900 French citizens have gone to Middle East battlegrounds and some have joined I.S.I.S. According to a poll carried out by ICM for Russian news agency Rossiya Segodnya, in late 09/2014, revealed that 16% of French citizens have a positive opinion of I.S.I.S. This percentage increases among younger respondents, spiking at 27% for those aged 18-24 in France. Positive attitudes to ISIS in Germany showed less divergence, remaining between 3% and 4% for all age groups. *U.K – UK’s foreign secretary, William Hague, has said, on 06/16/2014, that as many as 400 British citizens may be fighting in Syria, including some fighting with Jabhat al-Nusra and I.S.I.S . The number was updated to 500 by PM David Cameron in a speech on 09/02/2014. * GERMANY – Germany In 06/2014 German authorities estimated that 320 German Jihadists are fighting in Syria and Iraq. It is also assumed that about 150 Belgian citizens went to fight in the Middle East ( In Arabic – Sham). *BELGIUM – It is also assumed that about 150 Belgian citizens went to fight in the Middle East ( In Arabic – Sham). According to the Belgian prosecution, following the Verviers raid, on 01/15/2015, more than 300 people have left Belgium to fight with Islamic militant groups in Syria and Iraq. * U.S– According to CNN, on 08/28/2014 more than 100 USA American participate in the Syrian War alongside Islamic organizations. * CANADA – As of early 2014, at least 130 people with Canadian connections – including citizenship or residency – were suspected of a wide range of terrorism-related activities abroad, Public Safety Minister Steven Blaney said, on 10/08/2014, in a parliamentary hearing. * SPAIN -According to Spanish authorities, 0n 01/15/2015, some 70 Islamist fighters who went to conflict zones such as Syria and Iraq returned to Spain in 2014. Spain Interior Minister Jorge Fernandez Diaz said in a recent interview that a dozen more have returned to Spain since the beginning of 2015. * AUSTRALIA – Foreign Minister Julie Bishop said, on 02/26,2015, At least 110 Australians have left to fight alongside militants in the Middle East and security officials said between 30 and 40 women were among them or were actively supporting the group in Australia. In an address to parliament, on 03/24/2015, Australian Prime Minister Tony Abbott. said that 230 Australian nationals were prevented from leaving Australia, in the past months, out of fears of joining radical jihadi groups in the Middle East such as I.S.I.S [Daesh] and security forces stopped 86,000 people for questioning at various airports around the country. The other Western Jihadists are from the rest of Europe, Australia and also few dozens from Latin America.